Collected for the first time in a Deluxe Edition, COSMIC ODYSSEY assembles an eclectic group of heroes to race against time to stop a cosmic entity hell-bent on destroying the galaxy. Do they have what it takes? Or will one hero bring destruction to an entire world? 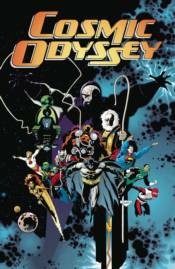 Collects the original four-issue miniseries, featuring Superman, Batman, Orion of the New Gods, Darkseid and many more!